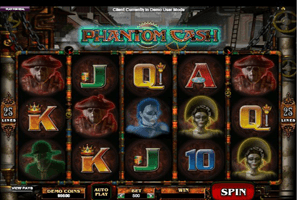 Phantom Cash is a unique Microgaming powered video slot game that is themed around the Victorian Era. Players will get to accompany two of the most popular and well known ghost hunters on their quest to hunt down the most dangerous ghosts. This is why as soon as the game loads, players will quickly notice the theme of the game as they will see the two hunters appearing as symbols on the reels of the game accompanied by ghosts, a haunted mansion, ghost hunting tools and colorful card symbols. These two hunters are none other than Carstairs and Thurmingham. Play Phantom Cash Slot here. The slot machine has a format of 25 paylines and a total of 5 reels. Players will find plenty of winning chances as they spin the reels after placing their wanted wagers. They can place these wagers under the reels by going through the betting options that the game has to offer them. The game has a couple of wild symbols that are represented by the two ghost hunters. Carstairs would only appear on the 5th reel while Thurmingham would only land on the first reel. Any wins created with the help of the wilds will be multiplied by 2. The Haunted mansion symbol is the scatter icon of the game that would give out great scattered pays as well as activating the free spins round that come with a multiplier. Players need to get 3 scatters in order for that round to be activated.